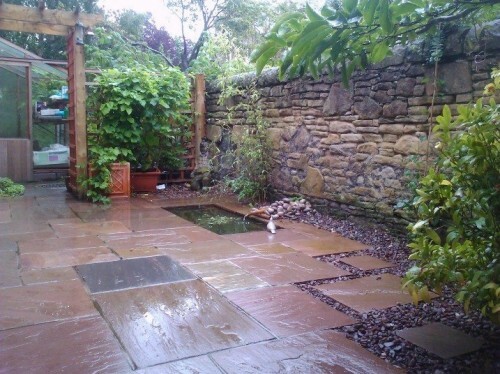 Here’s a Landscaping project we carried out for a client in Sciennes, Edinburgh. We removed the existing paved area and garden area and installed a Patio, Water Feature and Pergola with Trellis Fencing. View more of our work at deckingedinburghlandscaping.wordpress.com. 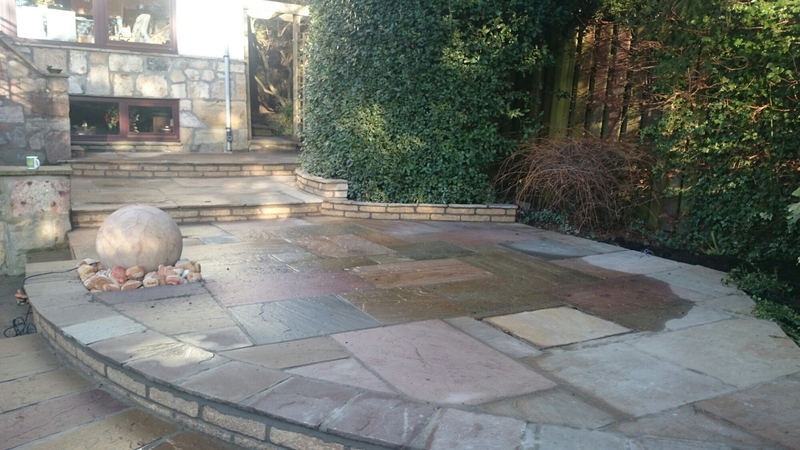 Here is a picture of a landscaping installation for a client in Edinburgh. we installed the hardwood timber deck which is made from yellow balau . fsc sourced and constructed the curved bespoke steps from solid oak leading down to the pond. Fibre optic lighting was fitted to the deck coming from a light source in the house. The lower terrace of thee deck goes over the pond to form a viewing platform to the pond. 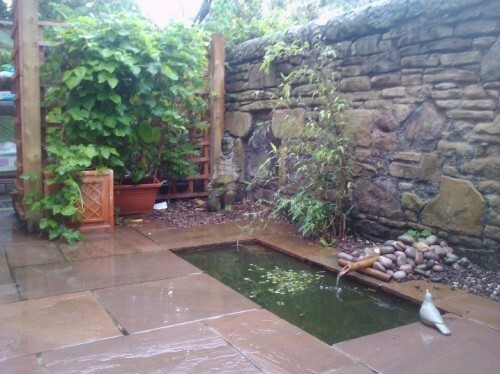 Sandstone paving was laid to the perimeter of the pond to form a path and lend a formal aesthetic. A waterfall was installed to right of picture. not visible, with the water coming from a pump fitted in the pond.Marginal planting to the sides such as Irises, Marsh Marigolds, Reeds and grasses with wter Lily to centre. Pond viewed from deck with waterfall to left of picture. 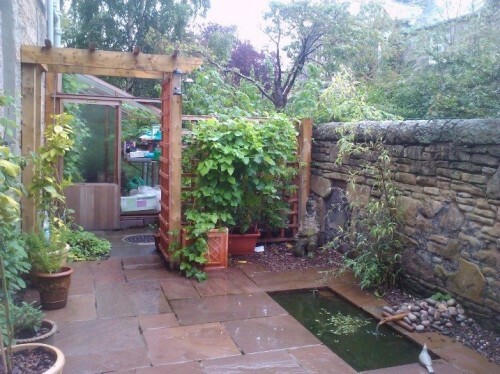 The customer had an old paved backyard with washing lines strung across which she wanted to transform into a striking low maintenance garden to compliment her new home office extension as the garden patio area would now be visible through the glass patio doors. The gravel to front of beds and to water feature give a good textural contrast to the smoothness of the rendered walls and compliment the colour of the paving. 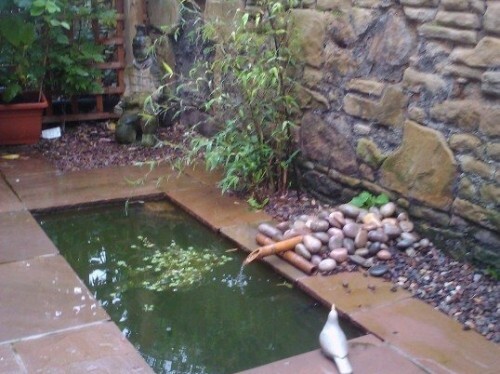 The ” bubble” pond to front bed sits on top of a water reservoir with a pump and the carved circular stone sits on top with the water bubbling through a centrally drilled hole running down the sides of the stone and back into the reservoir underneath the pebbles. This provides an interesting water feature and the gentle sound of the bubbling water echoes nicely creating a relaxing atmosphere. 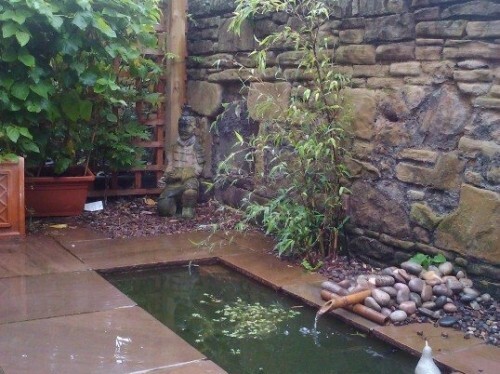 This garden pond has a strong Zen theme to it , with the minimal simplicity of the pond itself and the bamboo spout forming the fountain. Planting bamboo, Phyllostacis Nigra and the climber Hydrangea Petiolaris compliment the theme. Water Features, rendered walls concrete block walls painted white with solid oak sleeper coping, black marble water feature with uplighters to pond , bamboo and silver birch for architectural planting with lighting to rear, and barbecue to left of picture with spit roast. 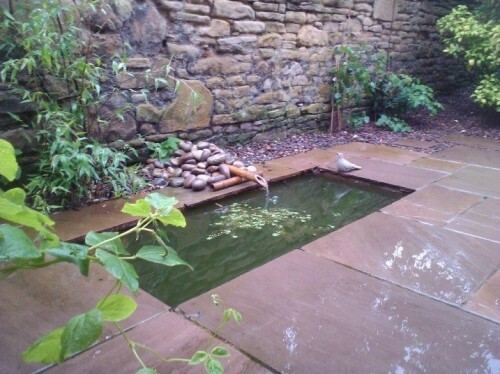 Grey slate paving with gravel to compliment contemporary landscaping theme.